The reopening of the moat at Lyngby’s historic fort protects against flooding, while retaining cultural heritage and creating a new recreational area. 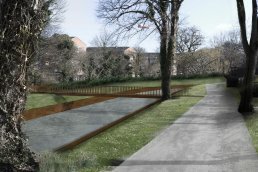 As part of its climate protection scheme, Lyngby-Taarbæk Municipality plans to reopen the moat at Lyngby’s historic fortress in cooperation with the utility company, Lyngby-Taarbæk Forsyning. The reopened canal is designed to handle wastewater, while blending into the urban environment and surrounding landscape. The canal creates a green recreational corridor through the municipality’s commercial center, Kongens Lyngby. In addition to this climate-safe area, the reopened fortress will convey a piece of Danish history about Copenhagen Fortress (Københavns Befæstning), which was in use from 1888 to 1920. The moat will form an integral part of the urban space and offer a recreation area for the city's citizens. The wastewater plant will disconnect wastewater from an urban area of 80 hectares, or roughly 50,000 m3. This reduces the risk of overflow to the stream, Mølleå, by 70%. This unique combination of water purification, urban space and cultural heritage regeneration has never been seen before in a Danish context, and the plans have been developed in close cooperation with citizens and the area’s allotment society. By remedying water overflows from drain basins, the reopening of the fortress’ moat in the municipality will reduce the risk of diseases caused by water and soil pollution. The project preserves local cultural heritage by restoring the fortress moat and ensuring a future-proof use for the monument as a tool in climate adaptation. By decoupling an area of 80 hectares, the project strengthens resistance against climate-related risks such as heavy rain. Lyngby-Taarbæk Municipality is located in the Northern part of Greater Copenhagen in the capital region.